All the power and data cables are basically already attached and routed off into the corner with cable locks and zip ties. Since the mPC 945 only accomodates a SATA or IDE hard drive and an IDE optical drive there isn't much to connect after this is taken care of. About the only connectors you may need to reach are the miniPCI, CD-audio header, USB header, fan power cords, and the like. The miniPCI 802.11b/g wireless networking card. A single coaxial wire extends from the cards onboard antenna to an externally mounted dipole antenna at the rear of the MSI Mega mPC 945 chassis. 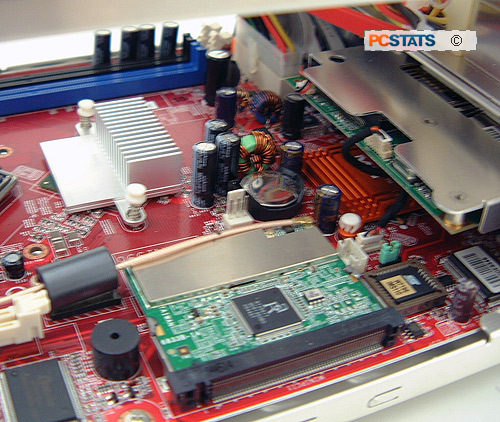 Even with the MSI MEGA mPC 945 fully installed, there is a ton of space inside to maneuver with, and users will find tasks like replacing the memory modules or swapping out a PCI Express videocard goes smoothly. Even the 3.5" hard drive and optical drives attach to an integrated drive rail system - there is hardly the need for a single screw when working inside the MSI Mega mPC 945 system! The Mega mPC 945's two DDR2 memory slots will support up to 2GB of dual channel DDR2-533/667 memory. The DIMM slots are positioned along the outer edge of the motherboard so memory can be replaced while the system is fully installed without difficulty. MSI does a decent job with cable management, using plenty of clips to keep the machine organized. Managing the cables at the bottom of the drive bays might have been a challenge were it not for the fact that a plastic tab helps keep all the wires tucked out of the way. 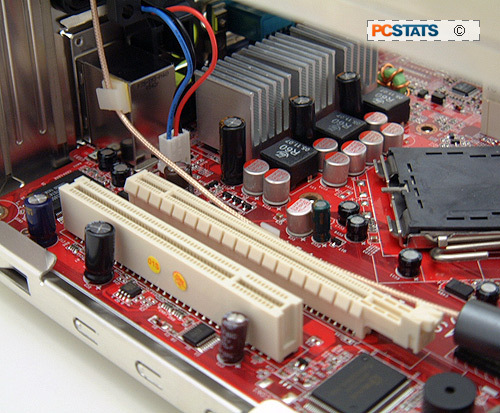 The system has a PCI Express x16, 32-bit PCI, and miniPCI slot for peripheral expansion. 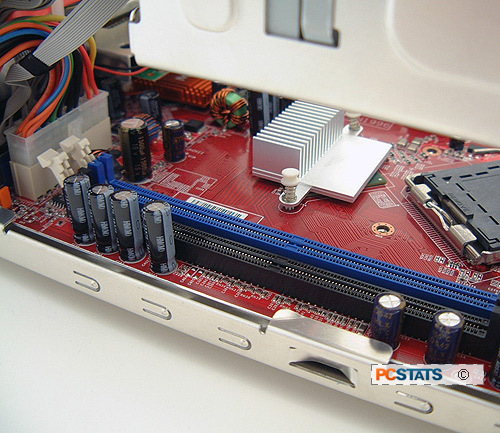 The miniPCI slot came populated with a 802.11b/g wireless networking card in the model PCSTATS tested. When everything is put together, the MSI MEGA mPC 945 is a very compact SFF machine and does not generate a lot of noise. The mPC 945 system doesn't generate much heat, but you'd be well advised to not block off the side or rear cooling vents. In our tests with the MEGA mPC 945, we found it very quiet to operate for the most part, but under intense load the CPU fan does become somewhat loud.